Jennifer B. Habel, a Canton, Ohio native, practices in various areas of law. Ms. Habel's practice focuses on Family/Domestic Law, Civil Litigation, Criminal and Municipal. Attorney Habel is admitted to practice before all Pennsylvania State Courts and the Middle District of Pennsylvania. She is a member of the Pennsylvania Bar Association, American Bar Association, Pennsylvania Bar Young Lawyers Division and the Huntingdon County Bar Association. 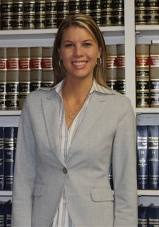 Ms. Habel graduated from Widener School of law, where she was a member of the Moot Court Honor Society. Attorney Habel received a Bachelor of Arts and graduated from Juniata College. Ms. Habel is an assistant volleyball coach for Juniata College. Attorney Habel is the Solicitor for the Townships of Lincoln and the Borough of Mapleton. Ms. Habel has also donated her time in various community programs such as Huntingdon County Career Day.